Phar Lap was such an exceptional individual that the producer of the movie Phar Lap wanted the actor playing the big red horse to be one-of-a-kind, too. The movie’s horsemaster and head trainer searched for months with no luck. Finally, the two were visiting a friend on a ranch (called a “station” in Australia) 800 miles northeast of Melbourne, Australia, when they spotted a horse they were interested in. Standing in a paddock was a 17-hand chestnut gelding of Thoroughbred and Australian Waler breeding. The livestock handlers who worked at the station thought he was too tall for stock work, so he went unused. The horsemaster and head trainer were immediately struck by how much the big red horse, named Towering Inferno, looked and moved like the real Phar Lap. The trainers immediately started working with the big gelding, affectionately called “Bobby” — the same pet name given to the real Phar Lap — and taught him to rear, paw the ground, play dead, and race next to a camera car. When Bobby was presented to the media a short time later, journalists were struck by how much the big gelding looked and acted like their beloved Phar Lap. What is an Australian Waler? A Waler is an Australian type of horse descended from Thoroughbreds, Arabians, horses from the Cape of Good Hope, Clydesdales, and Timor ponies. The rough terrain created a durable animal for ranch work and remount purposes during World War I. Eventually all Australian remount horses exported to other countries were called Walers. After the mechanization of war and livestock wrangling, the Waler fell out of favor and thousands became feral horses, later called Brumbies. Many of them were slaughtered for meat and shot from helicopters. It wasn’t until 1986 that the Waler Horse Society of Australia was founded to preserve the last remaining horses of Waler type with the goal of growing their numbers and promoting them as sport horses. The film’s horsemaster, Heath Harris, bought Bobby from his owner after the film wrapped and took him on many personal appearances to raise funds for Australian charities. Over the years Harris developed a rapport with Bobby that resembled the close relationship between Phar Lap and his groom, Tommy Woodcock. In 1999, when he was 26 years old, Bobby was standing in a pasture when he was struck by lightning and gravely injured. Harris was forced to euthanize the horse, calling it “the hardest day of his life,” according to Hollywood Hoofbeats by Petrine Day Mitchum and Audrey Pavia. 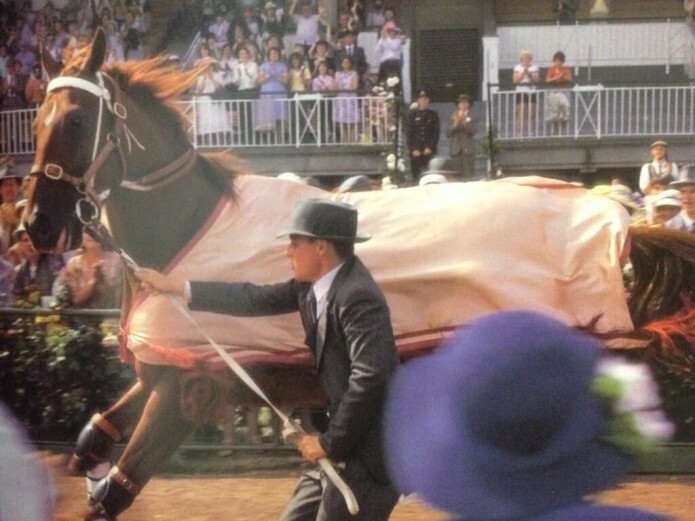 Read more about this remarkable gelding and the filming of Phar Lap in Hollywood Hoofbeats. Watch a memorable scene from the movie below.